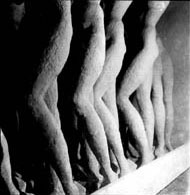 The 'Exposition Internationale du Surrealisme' which was held at the Galerie Maeght in Paris in July 1947, under the direction of Andre Breton and Marcel Duchamp, was a 'spiritual parade', planned to the last detail to establish the directions that members of the group were to follow on the threshold of the post-war period, and to take stock of everything that surrealism had acquired since its beginnings. The exhibition brought out into the open a need which until then had remained unvoiced : the need to create a collective myth. The visitor came next to a hall divided into two parts by 'curtains of rain' which poured down on to a floor of duckboards. This room housed magnificent paintings by all the masters of the movement. The only way out of the room was by going round a billiard table, which should have been in constant use — an idea which could not be maintained. Then came the initiatory labyrinth, where visitors were guided by a transparent Ariadne's thread. Here, twelve octagonal recesses, like the cells of a honeycomb, were set out as altars, dedicated, alter the pattern of pagan cults, to beings or to objects capable of being endowed with a mythical life. So they were consecrated to animals (The Condylura, or Star-nosed mole, or The Secretary-Bird), to phantom objects (The Wolftable, by Victor Brauner, which he used in several of his paintings, the Window of Magna sed Apta, which had been described by George du Maurier in his book Peter Ibbetson), and to fictional characters (Jeanne Sabrenas, the heroine of La Dragonne by Alfred Jarry, or Leonie Aubois d'Ashby from Rimbaud's poem Devotion). An electric bell rang continuously. Surprise followed surprise - the visitor passed from canvases to sculpture, from masks to 'objects' of every kind, and the whole was surrounded by a luxuriance of feathers, glass, mirrors, light and shadow. Works by newcomers to the movement, including Gerome Kamrowski, Braulio Arenas, Maurice Baskine, E.F. Granell, Seigle, Isabelle Waldberg and Isamu Noguchi, were scattered everywhere. 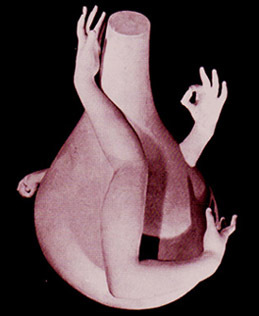 The fact that surrealism had not rejected Dada was shown by the presence, among the exhibitors, of the former leader of the Lyons dadaists, Emile Malespine, who showed 'kissograms' or mouth prints. The last room was crammed with documents, photographs, pamphlets, first editions, and still more objects. Eighty-seven artists from twenty-four different countries took part in this major exhibition, quite apart from the writers who contributed to the catalogue. 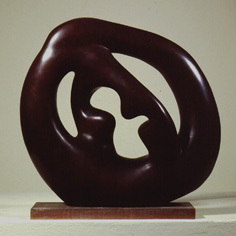 American sculptor and designer. He was the son of an American writer mother and Japanese poet father and was brought up in Japan (1906–18) before being sent to the USA to attend high school in Indiana (1918–22). In 1922 he moved to Connecticut, where he was apprenticed to the sculptor Gutzon Borglum (1867–1941). 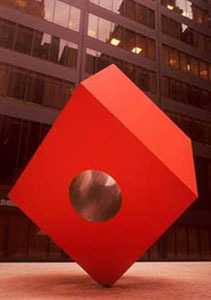 Discouraged by Borglum, Noguchi moved to New York and enrolled to study medicine at Columbia University (1923–5). From 1924 he attended evening classes at the Leonardo da Vinci Art School; encouraged by the school’s director, he decided to become a sculptor. 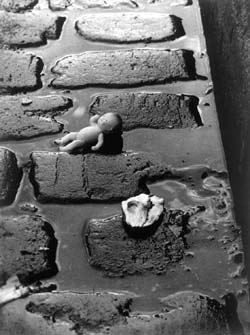 In addition he frequented avant-garde galleries, including Alfred Stieglitz’s An American Place and the New Art Circle of J. B. Neumann; he was particularly impressed by the Brancusi exhibition at the Brummer Gallery (1926). Preparations for the exhibition took place in an atmosphere of intense intellectual excitement, and impassioned discussion went into the smallest details. I recall an entire evening being spent in deciding what should go into the show-window in the Avenue de Messine; everyone put forward ideas for a symbolic display. 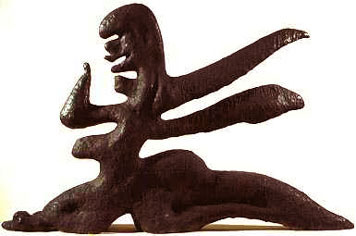 The choice finally fell on a sculpture by Victor Brauner, Conglomeros, three bodies with one head, which never lost its power to shock passers-by. 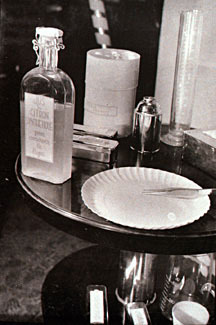 It was at this time that Antonin Artaud, who had been discharged from the Rodez asylum, spoke out with a prophet's voice, producing drawings which were like cries in which he expressed the human face, and Rene Char, Julien Gracq, Jacques Prevert and Aime Cesaire produced coruscating examples of the purest surrealist language. The review Neon, which set out to be a kind of poetic newspaper, was founded in 1948. Responsible for its layout was the Czechoslovak poet Jindrich Heisler, who had some most delightful inspirations. 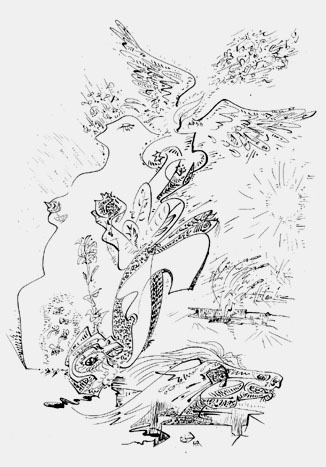 Finally, in autumn 1948, another exhibition, 'Solution surrealiste', at the Galerie du Dragon, offered itself as a meeting-place for young artists who were moving towards surrealism, and provided a register for them to enter their claims. So everything was ready for surrealism to become an effective organ of action which would absorb by synthesis the ideas which were in the air at the time. 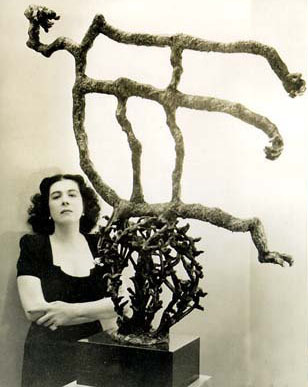 The Brazilian sculptor Maria Martins better known professionally as simply 'Maria,' as she insisted upon being referred to in all matters pertaining to her artistic life is one of the most important sculptors of the Surrealist period, singled out by André Breton in 1948 as the `shining star' of post-war art. There were some painters who were caught up with surrealism, but who soon sheered off in an opposite direction. This happened to Jean-Paul Riopelle, a Canadian painter whose work Breton and other members of the group found very attractive, although he did not share their worship of the image. 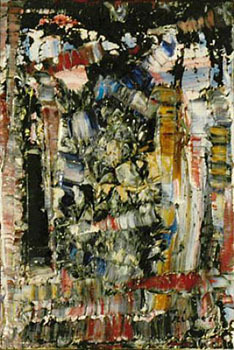 Riopelle was born in Montreal, and had been a disciple of Paul-Emile Borduas, the founder in 1944 of a Canadian group called the 'automatists', who derived their inspiration from surrealism. 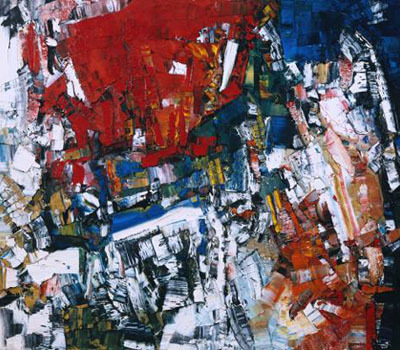 When he arrived in Paris, Riopelle shared a show called 'Automatisme' with the Canadian painter Leduc, and he took part in the surrealist exhibition at the Galerie Maeght. In pictorial automatism Riopelle was seeking freedom and breadth of gesture; his robust nature gave a special sensibility to his interlacing of colours. 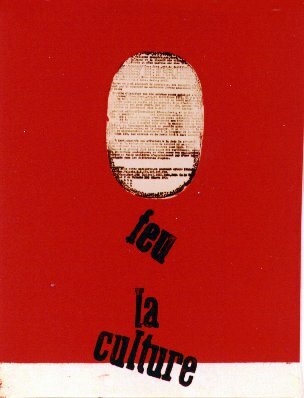 When he held his first major exhibition at the Galerie du Dragon in March 1949, Elisa, Andre Breton and Benjamin Peret contributed a portrait in dialogue to the catalogue. 'For me, his is the art of a superior trapper', said Breton, to which Peret added : 'Everything in the work of Riopelle is lit by the sun of the great forests, where the leaves fall like a biscuit of snow soaked in sherry.' 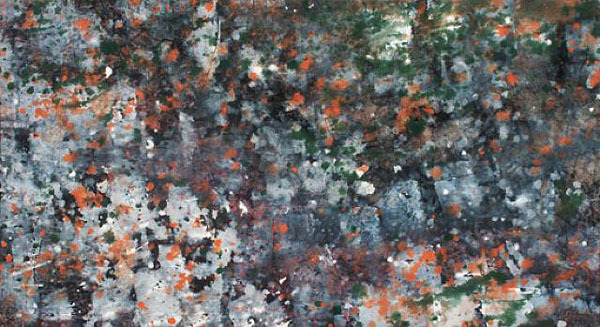 When Riopelle abandoned surrealism for lyrical abstraction in 1950, he was one of the most regretted of all the defectors. Another was Enrico Donati, an Italian painter who had come to Paris in 1934, and left for New York in 1940. Helped by his friendship with Marcel Duchamp, he stood out among the surrealists in exile in America; Donati was an exponent of a fluid form of painting, with colour glazes diluted on automatist principles, which vaguely evoked rockets or shadows in a night sky (The Cabal, 1944, Gore et Mandro, 1946). 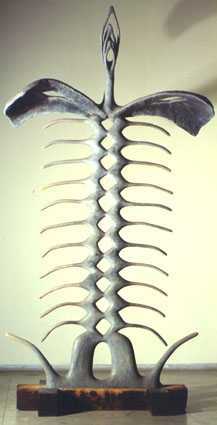 This seductive art, which was however rather slight, demanded some form of evolution. Donati turned towards the abstract in 1950, dividing each painting into stripes of granitic or coal-like matter. In September 1948, Andre Breton took part in the foundation of the Compagnie de L'Art Brut, which initially held its meetings in the basement of the Galerie Drouin in the Place Vendome. 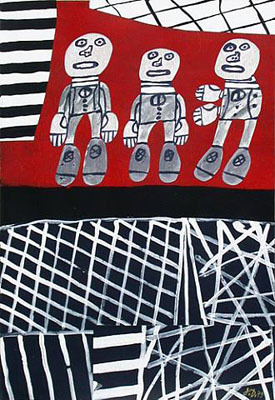 Jean Dubuffet had been the first, in 1945, to start collecting 'works by people unscathed by artistic culture'. 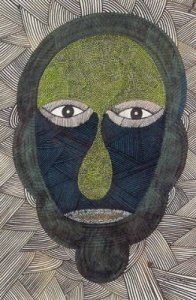 In October 1949, Dubuffet organized a big exhibition at the Galerie Drouin, as a preface to which he wrote a pamphlet on l'art brut (art in the raw or crude state) and its superiority to 'cultural art' : L' Art brut prefere aux arts culturels. The style of this pamphlet recalls Tzara's eulogy of idiocy. 'The wise men would have to commit the great harakiri of the intelligence, launch themselves on the great leap into superlucid imbecility ; that's the only way their millions of eyes would ever start to grow.' Breton encouraged this action, and took an interest in the brut painters like Miguel Hernandez and Aloise, and in the Scots-Canadian naif, Scottie Wilson, whose meticulous and disturbing Hand-made pen drawings are made up largely of minute parallel hatchings within firm outlines. Breton was fascinated most of all by Joseph Crepin, a plumber who had run a musical society, and who had subsequently discovered that he had the gift of healing. He treated his patients by sending them cut-out paper hearts which they had to lay on their chests. At the beginning of the war Crepin began to paint a long sequence of pictures, all of exactly the same size, because he had heard a voice which had told him : 'The war will end on the day when you have painted three hundred pictures.' He took a great delight in saying that he finished the three-hundredth on 7 May 1945. The same voice instructed him again in 1947 : 'You will paint forty-five marvellous pictures, and then the world will be at peace.' When Crepin died in 1948, he was working on the forty-second. His paintings consist of an infinite number of what he called 'points', which look like studs of colour. The beginning of the post-war period saw the blooming of the great masters or surrealism, who became international masters of modern art and whose influence can be seen in the new tendencies which formed at that time. Some of them isolated themselves, others stayed in close relationship with the movement, but all of them, even those who seemed to have broken away, moved towards the climax of an evolution which had begun or matured within the group. 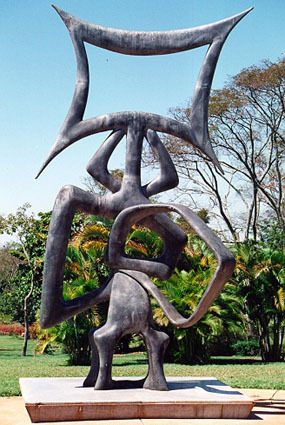 After Miro had produced his Constellations, in 1940-1, he went on in 1945 to large canvases with white or black backgrounds, which were followed in 1949 by a double alternating series of 'slow' and 'spontaneous' paintings, and then by extremely poetic pictures, whose light gracefulness is carried over into their titles : The Jasmines embalm the dress of the young girl with their golden perfume (1952), and Rhythm of the passage of the serpent attracted by the breath of the unloosed tresses of the setting sun (1953). In 1954 he stopped painting in order to make a series of ceramics in association with the potter Artigas; then in 1956 he left his Barcelona studio and moved to a house in Palma de Mallorca, where he picked up the thread of his inspiration, working, as he said, 'like a gardener'. Those who kept in faithful contact with Breton often did so trom a distance. At his home in Connecticut, Yves Tanguy, starting from pictures like The Rapidity of Sleep (1945, Art Institute of Chicago), set off en route for those vertiginous enumerations of stones which ended with The Multiplication of Arcs (1954, New York, Museum of Modern Art), and which seem to describe the depths of the abyss. 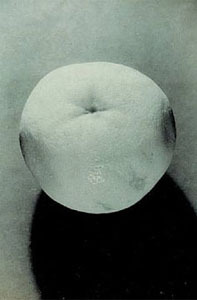 Hans Bellmer did not lose sight of his Doll theme, but now he carved and polished the image of woman like a rough diamond, as if he were trying to make the strangest jewel in the world. 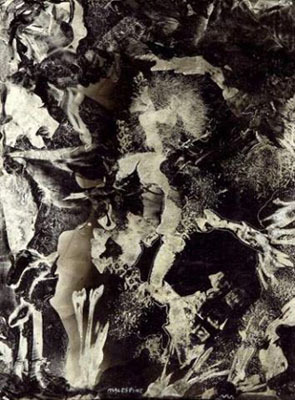 Wolfgang Paalen, in an attempt to found a 'plastic cosmogony', did a series of paintings on the theme of 'Ancestors to Come', and expressed the forces of nature and mankind without using symbolism or figuration. Rene Magritte pursued his mental adventure, image by image, using the methods which he had perfected to discover the 'never before seen' - the jamais vu - in the banal and commonplace. Max Ernst, who moved with Dorothea Tanning in 1955 to Huismes in Touraine, abandoned anti-painting in favour of painting. His etchings and his sculptures completed his statement of a universe 'in the interior of the view'. Wifredo Lam, who had a studio in Milan and another in Paris, was constantly on his travels, using his vocabulary of forms to evoke immemorial nostalgia. Andre Masson and Giacometti forged links with the existentialist writers, but their work did not acquire new meaning as a result. From 1947 Masson lived near Aix-en-Provence, and drew his inspiration from the surrounding countryside. 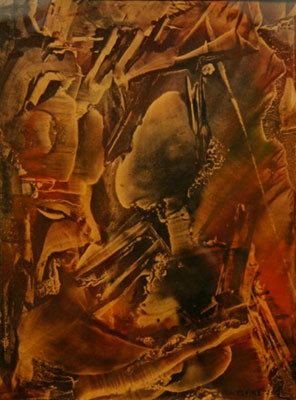 He did many etchings and lithographs which formed sequences such as Veminaire (1956). 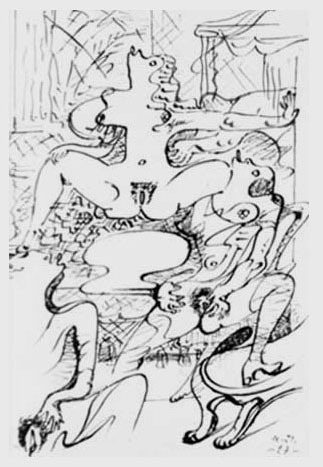 Then in 1962 he returned to his former paroxysmic manner with The Drunken Man, and then a series of India ink drawings. When Giacometti returned from Switzerland, where he had met his wife Annette, he resumed work at his Paris studio in 1945 on nudes and heads, which, as before, became smaller and smaller the more he worked on them. 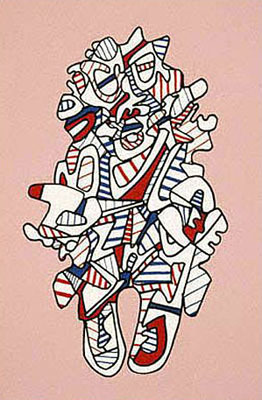 From 1949 to 1951 he made groups of static or moving figures. His avidity for perfection led him to seek the impossible even in certainty and reality. Victor Brauner, who stood apart from surrealism from 1948 onwards, moved out of his magic period to the evocation of an extremely varied personal mythology, with astonishing heroes, in a style which was predominantly calligraphic. From A Being retracted... (1948) to The Mother of Myths (1965), he contrived to enclose a poetic or philosophical story in every painting. Matta lived in Rome in 1949-55, and his painting drew nourishment from his political preoccupations. In Think, no more of fleeing (1953) and Cover the earth with a new dew (1955), he tried to achieve 'the marximum of being' without changing his style at all. His drawings - as in the scries of 1955, Mattamorphose (interieure et exterieure) - became graphic serial stories. 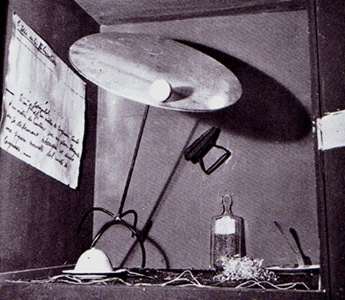 Altar for "La chevelure de Falmer"
"He who takes care of Gravity"
Salvador Dali's 'mystic period', which began with The Madonna of Port Lligat (1950) was nothing but a continuation of his 'revolutionary' period. Both periods derive from the 'paranoiac-critical method'. 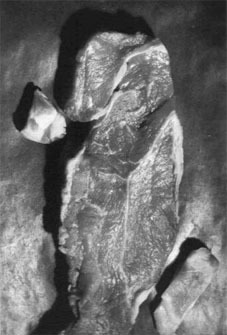 When in 1951 he published his Manifeste mystique in Latin and French, Dali painted a Soft self-portrait with grilled bacon (1951), which shows the skin of his face hanging on a branch like an empty envelope. 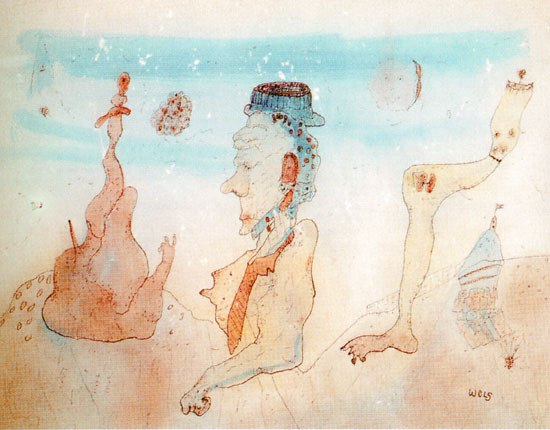 The Dali who in the past had said 'Beauty will be edible or will not exist', and who delivered a lecture in Barcelona with a loaf fastened on his head, is still there in toto in the Dali who, in a Sorbonne dissertation in December 1955, drew an analogy between the rhinoceros and the cauliflower, or in the Dal who, in 1956, illustrated Don Quixote by using a blunderbuss with bullets filled with ink. Some painters who had been attached to the surrealist group for many years made their presence felt only late, in the post-war period. Jacques Herold was a Romanian painter who had joined the movement in 1934, soon after his arrival in Paris, at the urging of Tanguy, whom he admired. When he failed to make the kind of contact with Breton and the group which he had hoped tor, Herold stayed on the fringe of the movement until 1938. 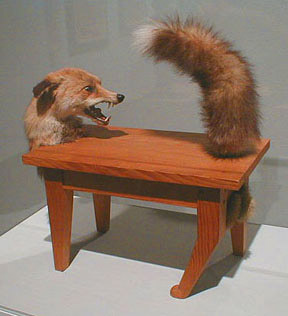 At first his canvases showed flayed animals. In his own words he was moving towards 'a systematic flaying, not only of characters, but also of objects, landscapes, the atmosphere'. He even wanted 'to tear the skin from the sky'. Then he became haunted by crystal, and his forms took on a stratified, vitrified appearance, with facets or cutting edges. 'As crystallization is a resultant of the coming together of form and matter, painting should strive towards the crystallization of the object. In particular the human body is a constellation of fiery points from which crystals radiate', he wrote. Dante and Beatrice (1939) is one of the earliest examples of this style, which later, in The Eagle Reader (1942), in Whirlwind of signs (1946) and in The Nurse of the Forests (1947, Paris, private collection), was applied to poetic subjects. 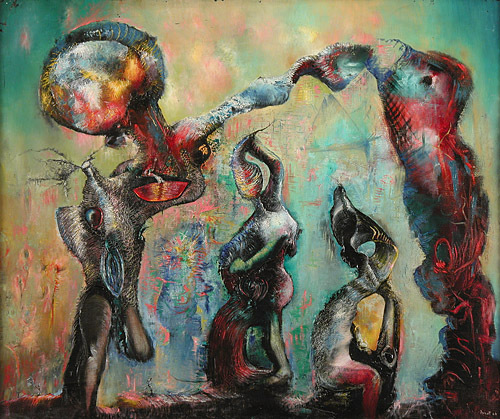 In 1951 Herold broke with surrealism, and conceived the ideal of 'painting the wind', which led him to effects of dispersion and luminosity which can be seen in The Initiatrix (1959) and The Pagan Woman (1964). He illustrated several books, and published a 'Maltreatise on painting' (Maltraite de peinture), a series of notes and drawings, in 1957. Clovis Trouille's painting emerged gradually from the shadows, where he had been peacefully cultivating it, and became the delight of a group of connoisseurs. 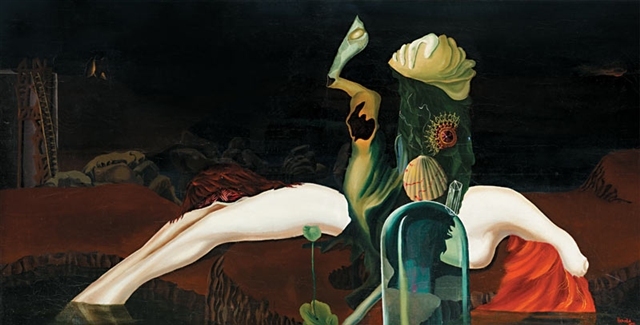 In 1930 his painting Remembrance was exhibited at the Salon des Artistes Revolutionnaires, and was noted by the surrealists, who henceforth claimed Trouille as one of themselves. Trouille was a Sunday painter - and what Sundays! - who worked in a Paris factory which made wax dummies for shop windows. His style was inspired by the Belle Epoque, in which his youth was spent, the gay 1890s and the Edwardian era. His imagery recalls the films of Melies, Art Nouveau posters, Grand Guignol, picture postcards, and the 'news in brief columns of Le Petit Journal. Clovis Trouille wanted to be an 'arbitrary colourist' and to illuminate scenes of passion to the ultimate degree. 'I use academic forms and themes for subversive ends. That is what I find piquant', he has said. He painted 'anti-everything' pictures, to which he returned year after year to perfect some detail, and which he refused to sell. His painting My Funeral caused a sensation at the 1947 surrealist exhibition, and he has done two other versions which are just as remarkable. In 1942, in The Drunken Ship (le Bateau Ivre), where he shows convicts fleeing from a ship which has been wrecked, he painted Cezanne clutching a mast and trying to dodge a sailor's boathook. Since then, he has gone on producing strange and humorous pictures which are all evidence of his wit, which remains fresh, vital and sharp, and of his skill as a painter. In his work the unexpected bursts out like a cymbal clash. Outside the surrealist group, properly so called, there were several painters who, while not really sharing its spirit, contributing to its debates or submitting to its disciplines, appropriated its methods to lead a parallel existence. 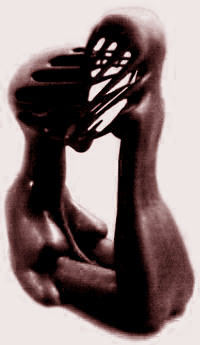 They battened on to what was most obvious in surrealism, the way in which it used fantastic imagery, and sometimes they achieved results which led the public to believe that they, as much as say Magritte or Tanguy, were part of the pictorial revolution which was carried out at the instigation and under the control of Andre Breton. 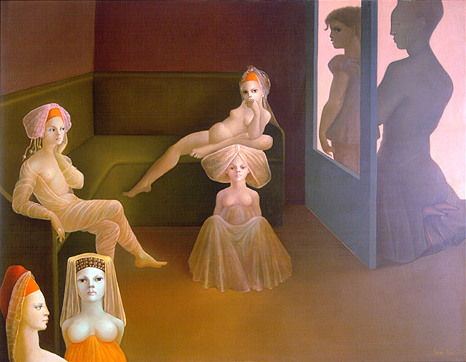 The most notable of the figures on the fringe of surrealism is Leonor Fini. She was born in Buenos Aires in 1908, spent her childhood and youth in Trieste, and finally settled in Paris. 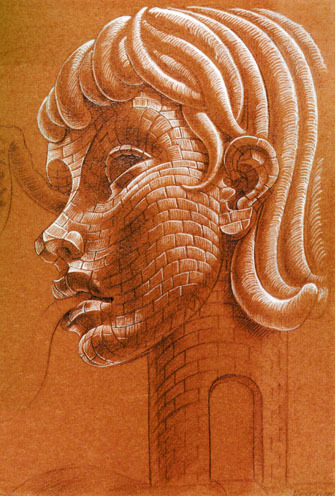 In 1936 she took part in the London 'International Surrealist Exhibition', and in 1937 the catalogue of her one-man show at the Julian Levy Gallery in New York included a preface by Chirico. Initially she drew her inspiration from Italian mannerism, with the addition of a modernist accent derived from the influence of Max Ernst. 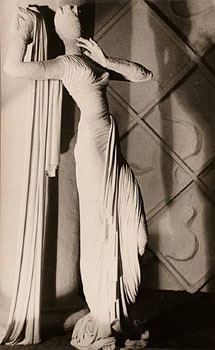 She placed a showy style at the service of an inspiration whose favourite subjects were sphinxes, vampires, witches and ghouls with strange accessories, masks and seashells : The Shepherdess of Sphinxes (1941, Venice, Peggy Guggenheim collection); Sphinx Regina (1946); The end of the world (1949)- Her painting, which is inclined to show Woman reigning over a world of artifice and guile, employs curious effects which can be found in her other work, such as her illustrations for Juliette by de Sade (1944), and her sets and costumes for the play, Le Mai court by Audiberti (1956). Her evolution finally brought her to produce female apparitions treated in the style of Viennese Art Nouveau (Jugendstil), which are similar to Gustav Klimt's figures, and which are certainly her best paintings : The Secret Festival (1964), The Window pane from the other side (1965). 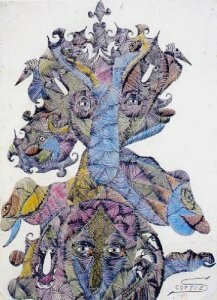 Felix Labisse, who was born at Douai in 1905, is another of these painters who while fluttering around surrealism, and superficially coming under its influence, remain 'painters of the image' whereas genuine surrealists wished to be 'painters of the unimaginable'. In 1923 Labisse went to live in Belgium, first at Heyst-sur-Mer and then at Ostend, where he became a pupil of James Ensor. Later he moved to Paris, and began to work as a theatrical designer. He designed Jean-Louis Barrault's first production at the Atelier in 1934, Аutour d'une mere, after Faulkner. He was a friend of Robert Desnos, who encouraged him from the start. Desnos wrote : 'His paintings already stand out for their sense of theatre, their lyrical inspiration, and, if I dare use the term in speaking of easel pictures, for their feeling of the open air'. His painting speculates on the theme of metamorphosis, and he plays on the contrast which derives from placing an animal's head on the body of a woman. In this idiom he showed a woman with the head of a praying mantis - Snatched Portrait (1942) - or with the head of a lioness : The Happiness of being loved (1943). 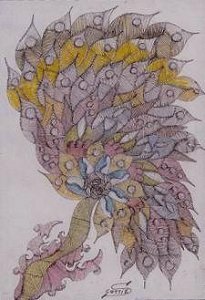 In a collection of drawings with an explanatory text, Histoire naturelle (1948), Labisse described a series of hybrid animals he had invented : The Rose-Tears, the Wyvern-Guenegote, the Adrouide, the Arthus of the Sands, and many others, including the Fluviot, a fish in the shape of a human face. He has always remained faithful to this kind of effect, with some variants. 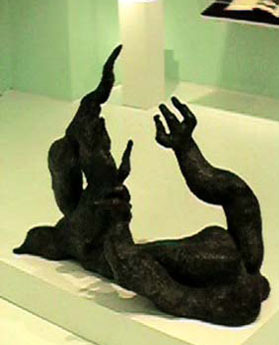 His figures later became tree-trunks in human form, as in The Inconstancy of Jason (1955); or his women were concealed behind a veil, as in The Mourning of Salome (1961). 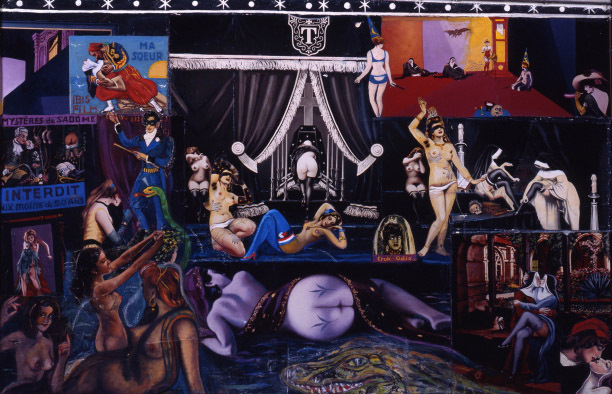 When he eliminated figures from his paintings he moved on to the evocation of 'libidoscaphes', which are a kind of meteor fallen in a desert space : an example is Libidoscaphes in a watchful state (1962). 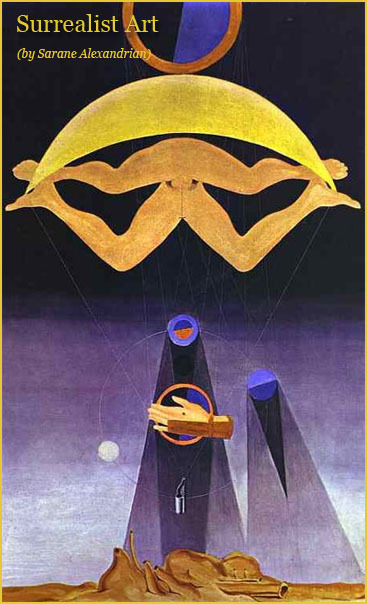 Around 1950, surrealism had to take up a definite position on abstract painting. 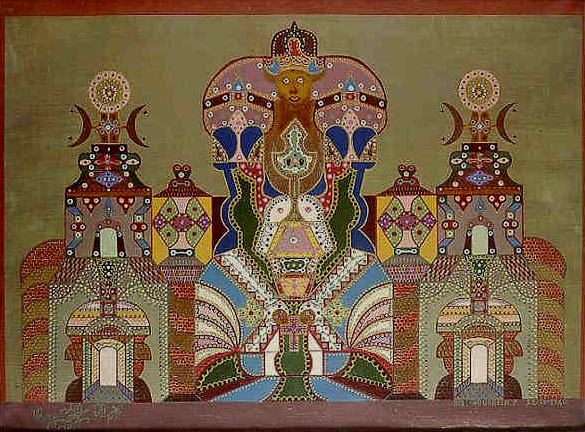 Until this time, the requirements of abstract art had been so fundamentally different from those of surrealist art that the surrealists had not even felt any need to define their position relative to abstractionism; this did not prevent Breton from admiring Kandinsky, or from claiming that Mondrian's Boogie-woogies were surrealist paintings. 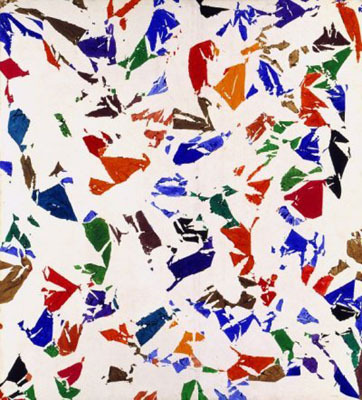 But after the war, geometrical abstraction gave place to lyrical abstraction : the painting of artists like Wols and Mark Tobey, which implied some inner drama or cosmic preoccupations, escaped from the aestheticism which the surrealists so detested. 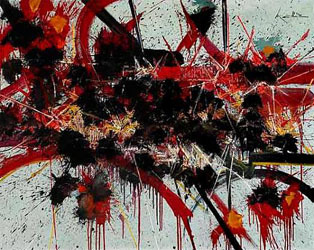 Action painting, which was derived from American Abstract Expressionism, involved the use of pictorial automatism, and so the surrealists were obliged to examine this automatism to see whether or not it could correspond to their views. Andre Breton gave his assent to this conception. The surrealist gallery, A L'Etoile Scellee, II Rue du Pre-aux-Clercs, opened in December 1952 with a group show, which was followed in January 1953 by the first one-man show of Simon Hantai, whose sixteen large paintings were saluted by Breton in the catalogue : 'Once more, as happens perhaps once in every ten years, we see a great beginning'. Hantai, a Hungarian painter who had been living in Paris since 1949, was at this time making picture-objects such as Solidified Dew (1953) and Collective Narcissus (1953), in which figuration tended to disappear under a riot of colour. In March 1953 Breton mounted a show at L'Etoile Scellee of four members of the October group, Jean Degottex, Duvillier, Matcelle Loubchansky and Messagier. This attempt to reconcile two movements which were so radically divergent was bound to end in failure. 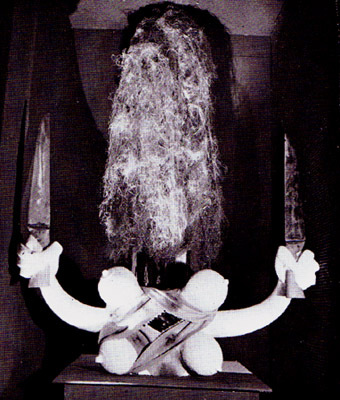 Hantai, to whom Breton had looked to bring it about, joined up with Georges Mathieu, with whom in 1957 he organized a series of exhibitions, commemorating the heresy of Siger de Brabant, which the surrealist group had anathematized in their pamphlet Coup de semonce. 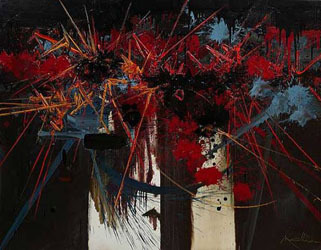 The word 'tachism', which no longer defined any kind of abstract surrealism, became synonymous with informal abstraction, and Mathieu himself used it to describe his painting. Breton overrode all these distinctions and returned to the line he had traced long before, proscribing 'the ribbon-work of art, at so much a metre', and praising the 'work of art as event', the only form which surrealism had always sought to produce.